If you’ve ever tried a professional-level video-editing application on your MacBook, you probably felt discombobulated. In iMovie, though, all the controls you need are easy to use and logically placed. To launch iMovie, click the iMovie icon in the Dock. (It looks like a star from the Hollywood Walk of Fame.) You can also run Launchpad and click the iMovie icon there. Choose File→New Project (or press cmd+N). Select the aspect ratio (or screen dimensions) for your movie. You can select a widescreen display (16:9), a standard display (4:3), or a display especially suited for an iPhone (3:2). If compatibility with the familiar SDTV (standard definition TV) format is important, choose the standard (4:3) ratio. If you’re shooting in 16:9 format, choosing 16:9 for an SDTV set will result in those familiar black letterbox bars at the top and bottom of the screen, but you won’t lose any content from the sides of the frame if you use 16:9. On the flip side, choosing 4:3 results in pillarboxing (black bars on the left and right) when shown on an HD set. The default frame rate is 30 frames per second (fps), which is normal for the North American NTSC video standard. However, you can choose a slower frame rate if necessary, such as the 25 fps setting for the international PAL and SECAM video standards. Click a Project Theme thumbnail to select a theme to apply to your finished movie. If you decide not to use a theme (by selecting the None thumbnail), iMovie can still add an automatic effect between clips. Select the Automatically Add check box and click the pop-up menu to choose the desired effect. You can also create movie trailers in iMovie. Generally, however, it’s recommended that you create your trailer project after your movie project is complete. Why? For the same reason that studios create trailers when the filming is finished: After you complete your movie, all the clips will be imported already, and you’ll have a better idea of what you want to include while “teasing” your audience! You’re on your way! This is the whole enchilada, in one window. Monitor: Think of the monitor as being just like your TV or computer monitor. Your video clips, still images, and finished movie play here. Media Browser toolbar: This row of buttons allows you to switch between your media clips (video clips, photos, and audio) and the various tools that you use to make your film. The selected items fill the right side of the browser pane below the monitor. Event Library: This list (lower left) displays all the video clips you can add to your project, including video clips you’ve created in iPhoto. These clips are organized as events. Event pane: If you select a video clip in the Event Library list, iMovie displays a thumbnail of the content in the Event pane. If you decide to include the clip, you can add it to your project. 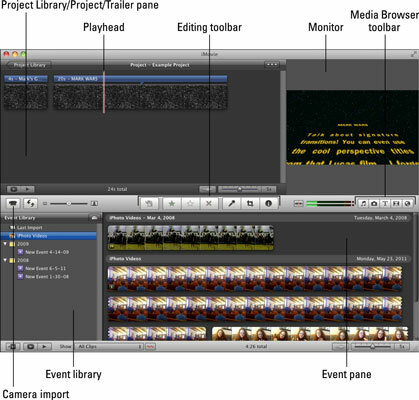 Project Library/Project/Trailer pane: iMovie displays the movie projects that you create in the Project Library pane. Note that when you double-click a project in the Project Library pane, it turns into the Project pane, which displays the elements you added to that specific project (such as video clips, still photos, and audio clips). If you drag an element into the Project Library pane, it turns into the Project pane for the selected project; if you’re working on a movie trailer, the Project Library pane turns into the Trailer pane. Playhead: The red vertical line that you see in the Event and Project Library panes is the playhead, which indicates the current editing point while you’re browsing clips or creating your movie. When you’re playing your movie, the playhead moves to follow your progress through the movie. Editing toolbar: This strip of buttons allows you to control editing functions such as cropping; audio and video adjustments; voiceovers; and selecting items. Camera Import window: Click this switch to import DV clips from your DV camcorder or your MacBook’s built-in FaceTime HD camera. 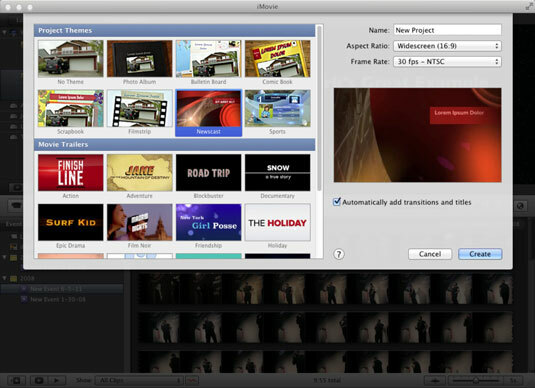 Those elements are the major highlights of the iMovie window. A director’s chair and megaphone are optional, of course, but they do add to the mood.